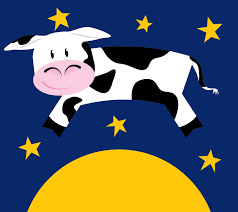 Mr. Mueller has been heard singing, "Hey diddle diddle, the cat and the fiddle, the cow jumped over the moon . . ."
Eager for a lift to ratings in sagging academy awards ceremonies, a new movie on Russia-gate has Hollywood excited and uplifted. The basic problem with the collusion theory has been Mr. Mueller’s finding nothing, as passed along by Attorney-General Mr. Barr. The hugely noticeable NOT in that statement has led to a sound equivalent to the air rushing out of a collapsing 40-storey balloon. No evidence!? Zilch, zip, nada, nothing, empty, fraud, a total hoax—these descriptives, in typical headlines, have followed two years of accusations. Worse, analysts say, pursuit of the collusion delusion has obscured attention to harm Trump has actually been doing—serving the billionaires, alienating most of the planet, sniffing toward a series of new wars. Instead, collapse of the collusion-delusion story has engulfed Washington D.C. in a torrent of sadness. Mr. Schiff has shaved his head plus used cosmetic facial surgery to resemble Mr. Putin. Rachel Maddow has died her hair blond. Triumph of the Collusion also calls upon the considerable acting skills of former CIA Director John Brennan; former FBI Director James Comey; and Former NSA Director James Clapper. These were the gentlemen who pronounced varying degrees of "confidence" in assessments on Russia-gate back in January 2017. In the new movie, they are shown in a dark room conferring on their assessments. They seem uneasy. Mr. Brennan is sucking on a long cigar. They are worried because they did not examine the DNC servers, and based their conclusions entirely on a private intelligence service, Crowdstrike, employed by Hillary Clinton. They raise the question: Do they really need to pursue investigation additional to Crowdstrike? “Isn’t the likelihood of Putin’s doing this so very, very obvious?” Mr. Comey states, as if weary. “Well,” rejoins Mr. Clapper, “certainly obvious, or, if not--since we're only guessing--as the least untruthful truth?" Triumph of the Collusion will open this summer in major cities across the country, following proper advertising and hopes to get up some attendance.